Customer Satisfaction is our primary goal. Ladybaazar.com has a very simple return and exchange policy. We will gladly accept back any product in its original packing within 7 days of you receiving your product if you are not happy with the product for any reason. You will need to inform us within 24 hours of delivery of the product. Dont Worry! We will still gladly accept back the product and shall issue you a store credit equivalent to the amount of the product, which can be used to make further purchase on ladybaazar.com. • No refund what so ever will be made in this case. • Shipping carges if any paid by you for sending us parcel, we will give you extra 100 credit store for that. • Replacement will only be provided once, meaning you cannot replace an already replaced product again. What happens if we have received a defective product? We will gladly accept back any damaged product in its original packing within 7 days of you receiving your product for any damage/defects in the product. You will need to inform us of any damage/ defects within 24 hours of delivery of the product, in order to receive the replacement or refund subject to availability of the same product. Use our hassle free method to return. Refunds will be processed only if they cannot be replaced with a new product. Please make sure to report any and all problems associated with a single order/package delivery at the same time. Please provide us with maximum possible details as they would be the base of examining the defect or differences. Please contact our Customer Care team to initiate the return process. You can contact us by either sending an email to ladybaazaronline@gmail.com. Please do not return products without first speaking to our customer care. All returns request need to be put on an email to ladybaazaronline@gmail.com with images attached and the problem completely stated. Please also mention your order number, name and contact number with your returns request. We request you to not ship your return parcels until approved to send by us. There are chances that you might lose your parcel in such cases as the returns facility will have no track of the returned parcel sent without intimation. We are not responsible for the loss of goods that are sent without intimation. No refund/request/replacement will be provided for goods sent without intimation. • The returned product should be in the original packaging, unused condition and in the same condition as you received the product. 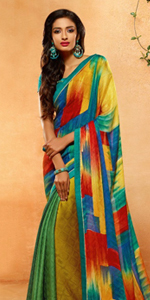 The return product contains all item like its bottom or dupatta or extra fabric etc. And if during any special offer which you get free extra product is also send to us with return product. If anything is miss then you product will not eligible for return. • In case you receive a damage or defective product contact us within 24 hours from the time of delivery. • Sachets/ packets accompanying the box should not be opened/ tampered with. • As safe delivery to you is our responsibility, in the same way sending back safely to us is your responsibility. If something happens in transit and the package doesn't get delivered to us, we cannot help you. So make sure to send through suggested postal service in our return authorization mail only and forward the details to us and keep the airway bill or postal receipt till it gets delivered to us. • However, you must understand that we can't bear a loss either; so return of products will be accepted only if the products are returned in a saleable condition with the tags intact and in their original packaging, in an unwashed and undamaged condition. • Refund/ replacement for goods/ merchandise is subject to inspection and checking by Lady Baazar team after they are received at our facility. • Under no circumstances the refund amount can be more than the amount paid for the product. • products will be refunded only if they cannot be replaced with a fresh piece. • If your purchase was made in the period of a special promotional offer, contests or any special scheme then special rules might apply for returns. • Any shipping costs of sending back to India above what customer paid for shipping charges while receiving them from India are the responsibility of the customer. • Stitched goods cannot be returned or refunded. • If the payment was made by Credit Card, Debit Card or Net-Banking, we will reverse credit to the same Banking account. • If the payment made was by Cash on Delivery, we will transfer the amount to your Bank account or by cheque..
• Shipping Charges and Cash on Delivery charge would not be included in the refund value of your order as these are non-refundable charges..
• If the payment is made through Coupons/ vouchers or Reward Points no refund will be granted. • Refunds are subject to the availability of the replacement product. Refunds will be processed only if they cannot be replaced. You can not return product if you have any issue regarding kurti and its fabric. You can not return product if you have size issue regarding kurti cause its free size and semi-stitched. • The details of the products or product specifications (for instance weight, color, handwork details, size, etc.) quoted with the product displays are only approximate values. • While every endeavor has been made to accurately reproduce colors, there may be minor variations in color of the actual product because of the nature of fabric dyes, weather at the time of dying and differences in display output due to lighting and digital photography and color settings and capabilities of monitors. • A customer must place an order keeping in mind this minor variation in color as seen on a computer screen against the actual color of the outfit received. • It is practically impossible for us to replicate the same colors on an outfit as seen on your monitor. A variation in the shade selected by you is considered as a normal practice as these garments have a tendency to reflect different shades of a color under different light and weather, type of camera used for photography or type and settings on the computer monitor. 2. Many a times green and blue shades also overlap. same is the case with offwhite, white and cream colors. Sea Green color sometimes looks Aqua blue and the other way around. 3. Some fabrics like raw silk, khadi silk, cotton silk, south cotton, brocade have a textured effect where we can see the weaving & threads are visible in different directions which is a inherent characteristic or feature of that fabric and proof of its authenticity. These are not defects. This raw finish is the beauty of these fabrics. 4. Handcrafted, hand dyed, hand printed, hand painted, hand embroidered, handloom, hand weaved products will always have minor differences when we compare them as they are not made by machines. Each piece will be unique. Handicraft artisans always try their best to make each piece better than the previous one. So, the product will always have minor variation keeping the same theme constant in artistic manner. The raw finish of the handicrafts cannot be compared with machine finished products as this raw finish is the beauty of the handicrafts items. If you still have any questions about the returns procedure or buying from our website. Please mail us at support@ladybaazar.com and we will be happy to help you!